One of the questions that I get asked from time to time is why I am a womanist as opposed to being a Black feminist or a trans feminist? It's a fairly simple answer for me as to why. I don't see womanists engaging in the nekulturny behavior aimed at transwomen that has angered and turned me off for a long time. It's led me to reach the same epiphany that my African-descended cis sisters and other POC women have that feminism in the 2K10's or in whatever wave it's in at this point in time is of, about, by and for white women only and not only maintaining their privilege, but expanding it so they have the same equality, status and privileges as white males. It also seems like elements of them want the ability to oppress others, then cry white women's tears when you call them on their crap. Many white feminists also continue to ignore the fact that race and class intersections impact how women of color live their lives vis a vis theirs. Don't even get me started about the issues of transwomen of color. Think that's over the top or harsh? Look no further than the behavior of radical lesbian feminists and the continued ongoing exercises in spewing disco era hate at transwomen and transmen, their hate screeds in their blogosphere and their attempts to codify it into law at the local, national and now international level.. I can also point to the fact that as I write this no womanist, unlike a depressingly long list of radical lesbian feminists such as Julie Bindel have repeatedly erased my womanhood, made disparaging remarks in print or online about us or openly and are actively opposing my transsisters march to human rights coverage. From the time I made the declaration that I was a womanist, I have been welcomed with open arms and treated with respect by other womanists as they broke it down what they envisioned womanism to be, what it meant to them personally and shared their individual journeys with me in arriving at that point. I'm more of an Africana womanist, which means I'm not only concerned about women of color here at home and the issues that affect them but across the African Diaspora. Note I said women of color. Africana womanists take a more inclusive view of it. It's that element of it and that kind of inclusive thinking I most appreciate about womanism as a proud African descended transwoman. I want to not only uplift my race and my African descended transpeople, but do my part along with my African descended transsisters of being compliments to Black womanhood, not caricatures or impediments to it. But like any movement it isn't perfect and it also has some schools of thought emerging in it since the initial break with feminism in the 90's. I'm concerned about a small cadre of faith-based womanists who are spouting anti-trans rhetoric that would make radfems smile and are hiding behind their religious beliefs, cisgender privilege and Bibles as justification for their transphobia. I'm happy to note the faith based ones are called out on a regular basis in internal FUBU womanist discussions.and as a trans womanist who is also a Christian I don't want that kind of faith-based trans ignorance gaining a foothold and fouling mainstream womanism. You only need look at feminism to see what kind of toxic damage virulent transphobia has caused over three decades in that movement. I have enough issues on my plate fighting anti-trans bigotry and for trans human rights inside and outside the trans community. I don't want or need that drama erupting in womanist circles and the faith based womanists need to buy a vowel and get a clue that transwomen exist and aren't going anywhere. As Alice Walker said, "It's so clear that you have to cherish everyone. I think that's what I get from these older black women, that every soul is to be cherished, that every flower is to bloom." It's an opportunity to cherish transwomen and let our flowers bloom. We transwomen wish to continue dispelling the myths, misperceptions and outright lies routinely propagated about us by others . 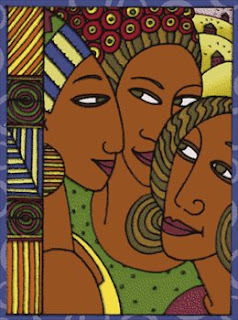 At the same time we need clarification on what we African descended transwomen can do to help womanism seize on its golden opportunity to embrace their trans sisters, continue building on the inclusive principles that attract us to it in the first place and shape its growth and forward momentum in a positive direction. Since my 'I am a womanist' declaration, I have yet to run into a womanist who disrespected my evolving feminine journey or has actively worked to deny me human rights coverage like people who call themselves feminists repeatedly do. I want to continue to be able to say that for the rest of the 2K10's and beyond. Shut Up Fool Of The Year Coming Soon! Merry Christmas 2011 TransGriot Readers! Tona's Shout Out To The TransMen! 2011 Texans Watch-Another Historic Win In Indy? 2011 Texans Watch-AFC South Division Champs!